The 2019 Toyota Camry Hybrid ranked #1 in Midsize Cars and Hybrid Cars. Currently, the Toyota Camry Hybrid has a score of 9.0 out of 10 which is based on our evaluation of 19 pieces of research and data elements using various sources. The 2019 Toyota Camry Hybrid is a top choice in the midsize car class. It has a lively powertrain, a large trunk, and loads of standard safety tech, including the welcomed addition of Apple CarPlay. 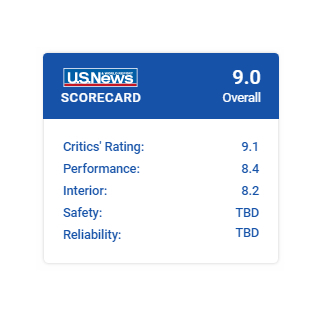 The 2019 Camry Hybrid has a perfect five-star overall safety rating from the National Highway Traffic Safety Administration. The Insurance Institute for Highway Safety has not yet released a score for the 2019 model year, but it tested the nearly identical 2018 Camry Hybrid. The IIHS named the 2018 model a Top Safety Pick+, which is the agency’s highest safety designation. In addition to a rearview camera, every Camry Hybrid comes with Toyota Safety Sense P (also called TSS-P). This suite of safety equipment contains a pre-collision system, pedestrian detection, lane departure warning with steering assist, automatic high beams, and full-speed adaptive cruise control. Available safety features include a 360-degree Bird’s Eye View camera, emergency rear braking, adaptive headlights, a head-up display, blind spot monitoring, and rear cross traffic alert. Whether you are shopping for a hybrid, or you’re in search of a practical and comfortable sedan, the Toyota Camry Hybrid is a fantastic car. In addition to being an excellent choice among hybrid vehicles, the Camry Hybrid’s strengths also stage it as an appealing midsize sedan. It checks off many requirements that families have, such as a roomy back seat, a large trunk, good safety scores, and lots of entertainment goodies. Its EPA-estimated gas mileage is also very impressive. A comfortable ride and an energetic powertrain round out the Camry Hybrid’s shining attributes. Should I Buy the Toyota Camry Hybrid? Whether you’re ferrying around the family or commuting to work, the Camry Hybrid is an attractive choice. It comes with lots of standard features, which helps compensate for its lofty price tag. The Camry Hybrid offers peace of mind, with a history of superb safety and predicted reliability ratings. You don’t have to spend $28,000 to get a good new car, however. For instance, the nonhybrid Camry costs around $4,300 less, and it’s also a top-ranking midsize sedan. Additionally, Toyota isn’t the only automaker with a hybrid sedan. Our midsize car ranking includes a half dozen other hybrids, with options from Ford, Chevrolet, Kia, Honda, and Hyundai. Alternatives worth considering include the Honda Accord Hybrid and Kia Optima Hybrid. These have attractive interiors, high crash test scores, and above-average predicted reliability ratings – all with starting prices that undercut the Camry Hybrids by a few thousand dollars. Which Toyota Camry Hybrid Model Is Right for Me? 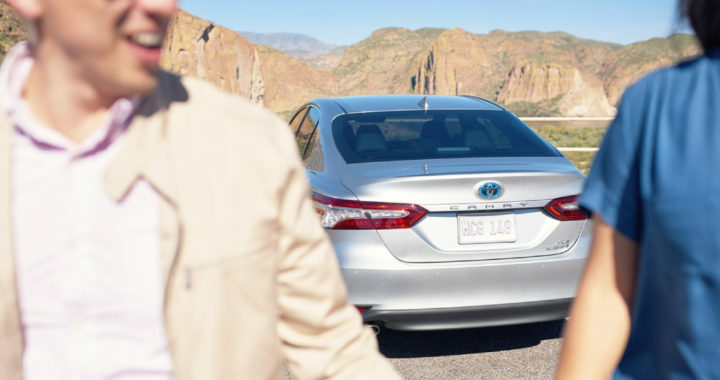 Toyota offers the 2019 Camry Hybrid in three trim levels: LE, SE, and XLE. All three have mostly the same hybrid components with the exception of the battery. A lithium-ion battery is in the base model, and the upper trims have a nickel-metal-hydride battery. For the best value, we recommend the base LE. Among its lengthy list of standard features are treats such as heated front seats, separate climate controls for the driver and front passenger, and an impressive suite of safety technologies. As a bonus, because the 2019 Camry Hybrid comes with the latest Entune system, you now get Apple CarPlay and Amazon Alexa as standard equipment. Standard features in the Camry Hybrid LE ($28,150) include heated front seats, a power adjustable driver’s seat, dual-zone automatic climate control, proximity key entry, and push-button start. You’ll also get Toyota’s newest Entune 3.0 infotainment interface, which boasts goodies such as Apple CarPlay, Amazon Alexa, and a Wi-Fi hotspot. A wealth of safety technology is also standard. In addition to a rearview camera, the Camry Hybrid comes with a pre-collision system with pedestrian detection, lane departure warning with steering assist, automatic high-beam headlights, and full-speed adaptive cruise control. The Camry Hybrid SE is the sport-tuned edition. Its notable features include leatherette-trimmed seats, paddle shifters on the steering wheel, and sporty styling elements. Prices start at $29,850. 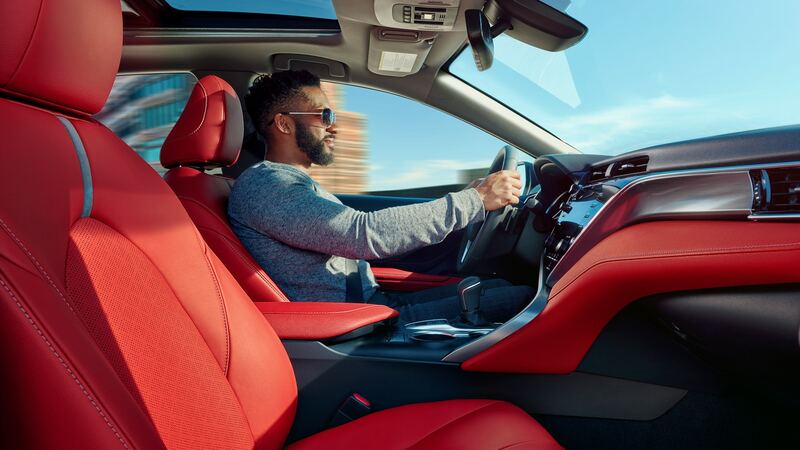 Leather seats, a leather-trimmed steering wheel, and ambient lighting create an upscale atmosphere in the Camry Hybrid XLE, which starts at $32,725. Its upgraded Entune system has an 8-inch touchscreen, additional USB charging ports, advanced voice recognition, satellite radio, and HD Radio. Other standard features include wireless charging for enabled smartphones, a head-up display, blind spot monitoring, and rear cross traffic alert. Should I Buy a New or Used Toyota Camry Hybrid? Deciding between a used and new Camry Hybrid comes down to how many features you want to pay for, and how important performance is to you. Launched in 2018, the current generation of the Camry Hybrid is vastly better than the previous one. Its brakes are smoother, and its base fuel economy rating is phenomenal. A wealth of safety features also became standard with the redesign. For 2019, the Camry Hybrid gains standard Apple CarPlay and Amazon Alexa. If you can live without these updates, consider a 2018 Camry Hybrid instead, which could save you money. Even though the previous-generation Camry Hybrid models aren’t as refined as new Camry Hybrids, they still have a lot of offer and will likely cut your purchase costs down even further. Our Toyota Camry Hybrid review includes far more than just one person’s opinion. We collected professional evaluations from 19 sources and combined them with concrete data like fuel economy estimates, safety scores, and performance specs to help you make an informed buying decision. How Much Does the Toyota Camry Hybrid Cost? At $28,150, the new 2019 Toyota Camry Hybrid LE is one of the most expensive base models among midsize hybrid cars. At the other end of the lineup is the new 2019 Toyota Camry Hybrid XLE. Its sticker price of $32,725 is closer to average when comparing top trim levels in this class. You can view details on features and pricing for all Camry Hybrid trim levels in the Which Toyota Camry Hybrid Model Is Right for Me? section below. Which Is Better: Toyota Camry Hybrid or Toyota Camry? The gas-only Toyota Camry and the Camry Hybrid were jointly redesigned for 2018. Both rank among the leaders in the midsize car class. The nonhybrid Camry is a better pick if you prioritize performance over fuel economy, as it offers better handling and an available V6 engine. It will also save you around $4,300 with its lower MSRP. On the other hand, the hybrid edition significantly lowers your carbon footprint, and it will save you an estimated $400 in fuel costs each year. Which Is Better: Toyota Camry Hybrid or Toyota Prius? Although the Camry Hybrid has a higher price, you’ll likely enjoy driving it more than you will a Toyota Prius. Remarkably, estimated fuel costs are equal between the two. Though the Prius can’t quite match the Camry’s power, ride quality, or rear-seat legroom, it does have a few advantages to be aware of. First, its lower starting price can save you close to $4,700 at the time of purchase. The Prius is also worth considering if you need a large cargo area more than you need a roomy back seat. Which Is Better: Toyota Camry Hybrid or Honda Accord Hybrid? Like the Camry Hybrid, the Honda Accord Hybrid is a much better vehicle following its 2018 redesign. The Camry and Accord hybrids share many of the same strengths. Both are economical and expected to be very reliable. With either model, you can count on a history of excellent crash test scores, backed by an impressive amount of standard safety features. We recommend taking both out for a spin to determine which interior and overall design you prefer. How Many People Does the Camry Hybrid Seat? The Camry Hybrid has five seats, and it comes standard with cloth upholstery and a power-adjustable driver’s seat. Travelers will enjoy the Camry Hybrid’s quiet cabin, which has a good amount of room in both rows of comfortable seats. The Camry Hybrid has two complete sets of LATCH child-seat connectors, as well as a middle-seat tether connection. The LATCH system in the Camry is easy to use, and all of the hardware is easy to find. 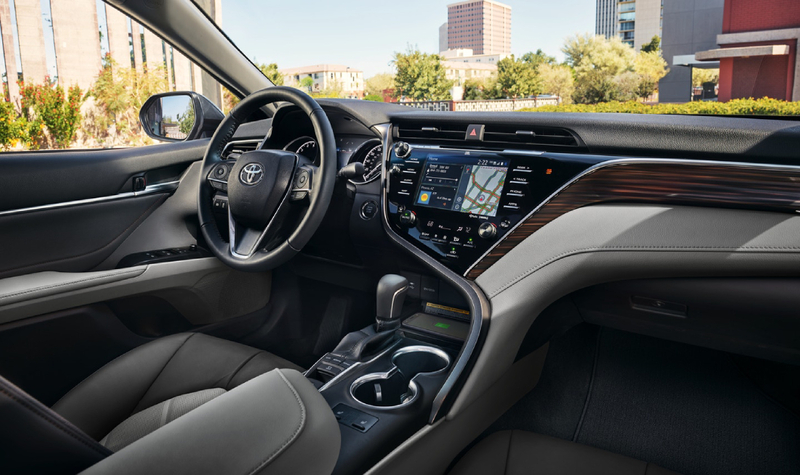 The Camry Hybrid’s cabin features an attractive selection of quality materials, though you will spot the occasional hard-plastic surface as well. Still, the overall atmosphere has a premium look and feel. This is especially true in the top-of-the-line XLE, which boasts leather-trimmed seats and Tiger Eye wood inlays. Hybrids commonly forsake some trunk space in order to make room for the battery, but that’s not the case with the Camry Hybrid. This Toyota’s 15.1-cubic-foot trunk is every bit as spacious as the nonhybrid Camry. Its trunk is also larger than almost every other hybrids in the midsize car class. One of the biggest selling points for the 2019 Camry Hybrid is that it now comes standard with Apple CarPlay, allowing you to quickly integrate the vehicle with your iPhone to display many of your favorite apps on the car’s 7- or 8-inch touchscreen. Amazon Alexa is also standard, allowing you to connect your car to your in-home device. For the most part, the Camry’s Entune interface is user-friendly, with knobs and buttons placed conveniently for quick adjustments. The Camry Hybrid is energetic, with enough oomph to easily merge onto the highway or overtake a slower car. It has a combined rating of 208 horsepower, which is actually higher than the base engine in the nonhybrid Camry. All models come with a four-cylinder gasoline engine, an electric motor, and a continuously variable automatic transmission (CVT). The type of battery that comes with the Camry Hybrid depends on the trim level. The base LE has a lithium-ion battery, and the SE and XLE have a nickel-metal-hydride battery – more on this in the fuel economy section below. The Camry Hybrid is one of the most fuel-efficient midsize sedans you can buy. The base model earns an EPA-estimated 51 mpg in the city and 53 mpg on the highway. The upper trim levels are rated at 44/47 mpg city/highway, which will cost the average driver an extra $100 a year in fuel, according to the EPA. The disparity in gas mileage ratings is partly linked to the differences in the type of battery. The ride comfort in the Camry Hybrid earns high marks. It’s not a flawless – you may notice some body lean and the occasional pothole – but the Camry Hybrid is still very agreeable on the road. Its regenerative brakes feel much more natural than those in pre-2018 Toyota Hybrids. Still, they may take getting used to for first-time hybrid-car owners. Front-wheel drive comes standard. Curb weight values for the Camry Hybrid range from 3,472 to 3,572 pounds. From front to back, this midsize sedan is 16 feet long. Is the Toyota Camry Hybrid Reliable? As of this writing, J.D. Power has not yet released a predicted reliability rating for the 2019 Camry Hybrid. In recent years, the sedan has earned excellent scores in this category. The 2019 Camry Hybrid comes with a three-year/36,000-mile basic warranty, a five-year/60,000-mile powertrain warranty, and an eight-year/100,000-mile warranty for hybrid components. It doesn’t matter if you are specifically wanting a hybrid or simply in search of a solid, comfortable sedan – the 2019 Toyota Camry Hybrid is worth a look. This well-rounded car is a good fit for many households, including those needing a carpool-friendly sedan or a commuter car that’s enjoyable to drive. Its biggest downside is the price. That said, the Camry Hybrid has a history of excellent predicted reliability ratings and high resale values so the above-average MSRP will be acceptable for many shoppers. Posted in New Vehicles, News and tagged 2019 Camry Hybrid for Sale in Cleveland Ohio, 2019 Camry Hybrid trimlevels, How Much Does the Toyota Camry Hybrid Cost?, Is the Toyota Camry Hybrid a Good Car?, New Toyota Camry Hybrid for sale in Akron Ohio, Schedule a Test Drive Akron Ohio, Should I Buy a New or Used Toyota Camry Hybrid?, Should I Buy the Toyota Camry Hybrid?, The 2019 Toyota Camry Hybrid Price, Toyota Camry Hybrid or Honda Accord Hybrid?, Toyota Camry Hybrid or Toyota Camry Gas?, Which Toyota Camry Hybrid Model Is Right for Me?.